Police say officers who saw the snake estimated it was 10 feet long. Just hours after two police officers spotted a large snake eating a mammal believed to be a beaver on the banks of the Presumpscot River early Wednesday, residents of Westbrook were abuzz about the biggest wildlife mystery to hit the city in recent history. A sign at a sandwich shop in Westbrook asks the question of the day: "Have you seen Wessie the snake?" Among locals, opinions about the slithery visitor range from fascination to disgust. A snake – described by one resident as being as long as a truck – has been spotted at least twice near Riverbank Park, a popular spot for children to play and feed ducks on the riverbanks. The snake has been dubbed “Wessie” by locals whose opinions of the slithery visitor range from fascination to disgust. 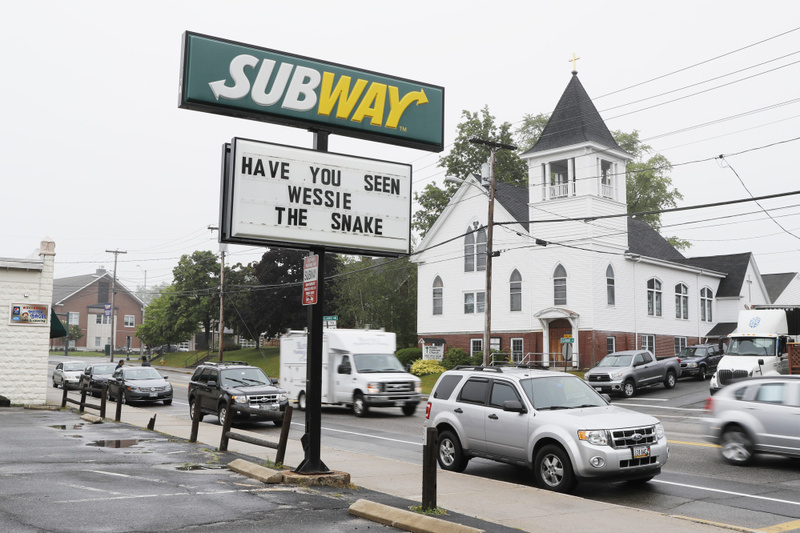 “Have you seen Wessie the snake?” queries the sign at the Subway sandwich shop on Main Street. Westbrook police put out a warning last week after receiving a report of a snake the length of a car at Riverbank Park. An officer on patrol in the Riverbank Park area around 3:30 a.m. Wednesday saw a large snake on the riverbank near Speirs Street. The officers tried to shoot a video of the animal, but the poor lighting made that impossible, police said. “The officer took a video, however it was worse than the Loch Ness photo and Bigfoot video,” the department posted on its Facebook page, where more than 200 people had commented on a post about the snake sighting by Wednesday afternoon. The Maine Warden Service was contacted and told police that the snake is expected to remain inactive for a few weeks since it just ate a substantial meal, police said. 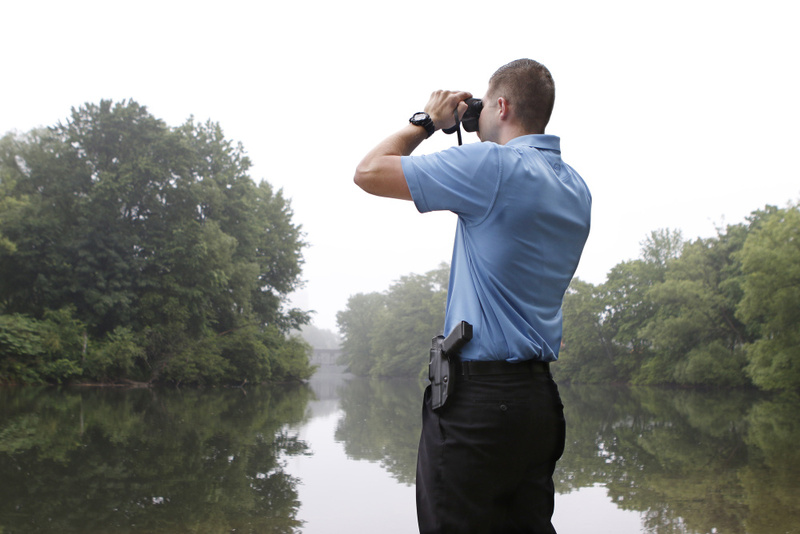 Midmorning Wednesday, two Westbrook police officers stood by the riverbank using binoculars to look for the snake as residents drove slowly past, hoping to get a glimpse of the action. 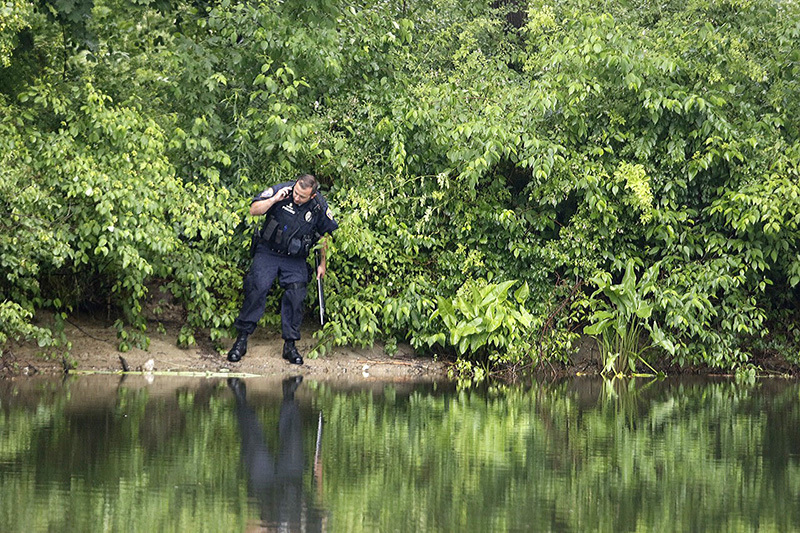 One officer used a stick to poke through the bushes on the opposite side of the river. Two wardens from the Maine Warden Service came to Westbrook to search for the snake, but to no avail, said Capt. Sean Lally of the Westbrook Police Department. “It’s kind of a novelty,” said Nancy Freedman-Smith of Westbrook as she sat in her car and watched the river. Freedman-Smith said the section of the river where the snake was spotted is a popular area for kids to swim and feed ducks. Shelley Davis, another Westbrook resident who came to the park to watch the short search, said she is concerned about a large snake being in an area where children play. Police don’t know what kind of snake was spotted, but officials believe it is most likely an exotic pet that escaped or was released by its owner. Lally said people shouldn’t avoid the park, but should be aware the snake could still be there. “It’s not any different than being aware of the possible presence of any animal, be it a coyote, bear or domestic dog,” he said. After feasting on the mammal early Wednesday, the snake has likely found a safe place to hide while it spends the next few weeks digesting its meal, wildlife experts said. Derek Yorks, a wildlife biologist with Maine Inland Fisheries and Wildlife, said the snake is most likely a Burmese python, a snake that is native to Asia but has been breeding in the Florida Everglades, though he can’t be sure until it’s caught or someone gets a better photo of it. He is certain that it is not a snake that is native to Maine. “None of ours are big enough to prey on something even as big as a squirrel,” he said. Maine’s biggest native snakes include water snakes, which grow to about 4 feet, and the endangered black racer, which can grow up to 5 feet long. Yorks said people in Maine who own large pythons like the Burmese are required to get a special permit from the state. Burmese pythons grow quickly and can be up to 20 feet long. The problem with Burmese pythons is particularly acute in the Everglades, where tens of thousands of pythons live. The annual Python Challenge attracts hundreds of snake hunters who compete for prize money. Yorks said the presence of a large snake can be unnerving, and even scary, for some people, but said people shouldn’t be overly concerned about the danger. A snake of that size would be unlikely to attack someone unless it was cornered or someone tried to pick it up, he said. But for those who are still freaked out by Wessie? Don’t worry, cold weather will be here soon enough. “They don’t do winter,” Yorks said. Westbrook police ask anyone who spots the snake to call dispatch at 854-2531 as soon as possible.